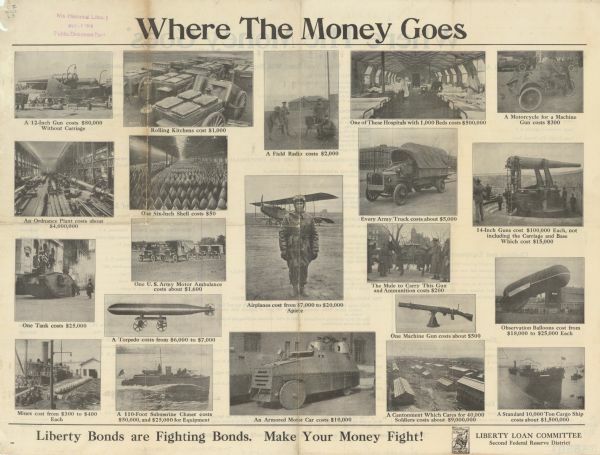 Front side of a double-sided poster, showing through photographs the resources purchased using Liberty Bonds. Poster text reads: "Where the Money Goes. A 12-Inch Gun costs $80,000 without carriage. An Ordnance Plant costs about $4,000,000. One Tank costs $25,000. Mines cost from $300 to $400 each. Rolling Kitchens cost $1,000. One Six-Inch Shell costs $50. One U.S. Army Motor Ambulance costs about $1,600. A Torpedo costs from $6,000 to $7,000. A 110-Foot Submarine Chaser costs $50,000 and $25,000 for equipment. A Field Radio costs $2,000. Airplanes cost from $7,000 to $20,000 apiece. An Armored Motor Car costs $10,000. One of these Hospitals with 1,000 Beds costs $500,000. Every Army Truck costs about $5,000. The Mule to Carry This Gun and Ammunition costs $200. One Machine Gun costs about $500. A Cantonment Which Cares for 40,000 Soldiers costs $9,000,000. A Motorcycle for a Machine Gun costs $300. 14-Inch Guns cost $100,000 Each, not including the Carriage and Base, Which cost $15,000. Observation Balloons cost from $18,000 to $25,000 Each. A Standard 10,000-Ton Cargo Ship costs about $1,500,000. Liberty Bonds Are Fighting Bonds. Make Your Money Fight!" See also Image ID: 130914. Liberty Loan Committee. Second Federal Reserve District.